With the regional cooperation project De Groene Zone (“the green zone”), several municipalities in the Dutch province of North-Brabant make it possible for 7,000 house owners to benefit from all advantages of their own PV power plant. The Dutch company Tautus from Groningen has won the tender that was initiated by the involved municipalities and decided for PFLAZSOLAR as installation partner for the realization of the 7,000 power plants. 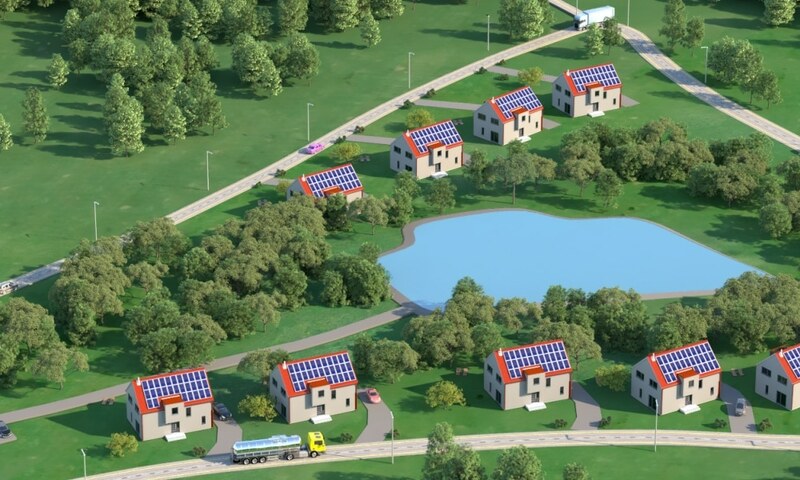 “Solar Energy is simple, good for the environment and good for the wallet” say the twelve municipalities which started De Groene Zone with the aim to reduce barriers for house owners that wish to invest in photovoltaics. An example for this is the financing of the PV power plants: Over a period of up to 15 years, house owners can finance the PV system on their roof on favorable terms. Interested parties receive the financing offer directly together with the purchase offer for their photovoltaic system. For Peter Hopmans, Project Manager from Tautus, the project De Groene Zone is a perfect way to push forward the energy transition: “De Groene Zone makes solar energy accessible for everyone, independent from one’s budget or knowledge.” The Dutch company is specialized in the development, financing and management of renewable energy- and other sustainable projects. Tautus decided for a good reason for PFALZSOLAR as cooperation partner: “With PFALZSOLAR we’ve found a reliable partner for whom a long-term and sustainable cooperation is as important as for us.” Says Peter Hopmans. Apart from this, Tautus and PFALZSOLAR are going to realize several large scale ground mounted PV power plants together in the Netherlands. The construction of the first project, a solar park in Noordwolde (Friesland), has already started in March. From the selection of a location via the acquisition and procurement of areas, right up to the building permit: before a solar power plant feeds the first kilowatt hour of environmentally-friendly electricity, much has to be done. Therefore, our Project Teams are composed of experienced technical, commercial and legal specialists, who work together for the success of our clients. Within the scope of project development, we accompany the entire approval procedure, close lease contracts for all required system and line property and obtain the feed-in licence from the energy provider responsible. The basis for this is the optimum technical planning of a solar park, which our solar professionals draw up whilst taking into consideration the framework conditions on site, such as the quality of the terrain and the grid connection capacity. One decisive factor for later sales and the financing of solar power plants is also the corporate law structure: If required, we develop photovoltaic projects directly within a project corporation founded especially for the purpose. With the PFALZWERKE AKTIENGESELLSCHAFT, the largest energy provider for the Palatinate region and the Saarpfalz district, we have a strong parent company standing behind Pfalzsolar which unites one century of company tradition with innovation and modern service concepts. The PFALZWERKE supplies over 400,000 private customers, more than 20,000 commercial customers, approximately 1,500 industrial customers and over 60 public and municipal utilities and 460 municipalities. For many years now, the Group, which has approximately 800 employees and an annual turnover of EUR 1.6 billion, has increasingly invested in energy concepts of the future. Together, we stand for sustainable energy provision. Today and in the future. Regular servicing and 24/7 monitoring are key elements of our integrated operational management concept, thus identifying faults, rectifying them early and avoiding losses. A fault can lead to a complete standstill of a solar power plant. Speed is therefore our strength. No matter where the photovoltaic system is, we guarantee a response as quickly as possible. Transparency is important to us. We therefore evaluate output data systematically, process it in a structured manner and completely document all service calls as the quality of our service is measurable by the performance of every single photovoltaic system. We believe that a personal contact partner is an integral part of excellent service. This means a solar expert who doesn’t only always keep an eye on each system but also on our customers’ individual concerns. Remote monitoring systems and modern control room technology enable 360° monitoring for our solar experts. This allows us to identify potential output risks in time and prevent them. If there should be a fault, we come quickly or, if possible, rectify the fault remotely. It goes without saying that we carry out a detailed analysis of the fault as that is the only way we can continually improve our service. Regular servicing contributes to the continued optimum performance of solar power plants. Our solar experts carry out necessary maintenance work quickly and reliably. Our experts know all about plant operators’ guarantee and insurance claims. If desired, we undertake the complete process of guarantees and claims. Special large photovoltaic plants are often operated within the framework of project corporations. This brings with it the need for separate accounting, independent annual financial statements and much more. Our customers also benefit from our many years’ experience in commercial operational management of large projects. We put together individual services which are customised to the plant operators’ needs, ranging from grounds maintenance to the comprehensive checking of the plant. Every solar power plant from PFALZSOLAR is the result of our years of expertise, our know-how and our passion for clean energy. For this reason, we not only act as a reliable partner to our customers up to commissioning of a system, but also afterwards. After all: professional operational management is a decisive factor for success regarding the achievement of maximum profits long-term. The financing of a large-scale project represents a decisive factor for success. Our photovoltaics experts possess comprehensive experience in project financing, and have not only closed numerous loan agreements in the past, but have also accompanied the associated projects successfully up to payment of the loan. We will continue to integrate our expertise in the financing of photovoltaic projects into the projects of our investors, both today and in the future. We don’t just construct projects which we have developed ourselves, but also EPCs as commissioned by our customers, partners and investors. This means: We provide all the services required for the turn-key erection of a solar power plant – whether an open area or a commercial or industrial roof: the final design of the system (Engineering), the procurement of all required components and services (Procurement) and of course the construction itself (Construction). Our long-term relationships with all renowned manufacturers and the scale effect achievable through large purchase quantities are a major advantage for our clients, in particular for the procurement of components. And during construction, too, we rely on our experience and our know-how: with a competent construction manager on site, we ensure that the projects are completed rapidly and smoothly. Here we place the highest value in all construction phases on a high-quality design – from the erection of the subconstruction right up to the grid connection.